Like already mentioned, I loved the breakfast at the hotel. The design of the breakfast place was very beautiful, too. It looked like a real kitchen. Design is something the Finns are very good at. 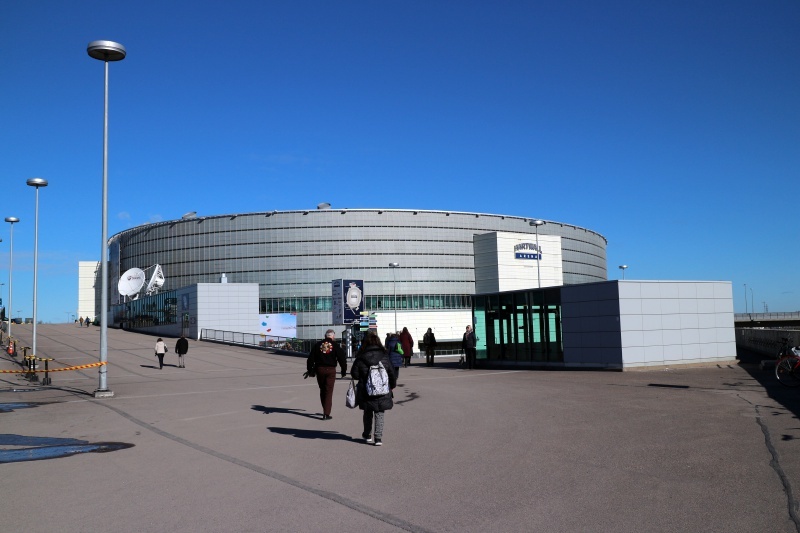 The way to the Hartwall Arena was quite easy for us even though the arena wasn’t just around the corner. 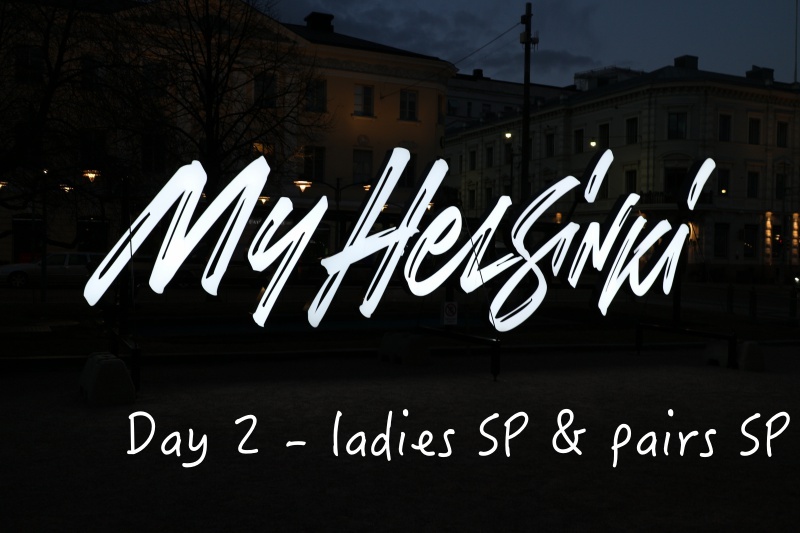 We walked for about ten minutes to the station and then we could take every train leaving Helsinki train station because every train would stop at Pasila where the Hartwall Arena is located. From Pasila, it was a 5-10 minute long walk to the rink. All in all, it took us about 1/2 hour to reach the rink. I was really annoyed by not being allowed to take full water bottles into the rink. I’m pretty sure this was not for security reasons only but also in order to sell more of the expensive drinks at Hartwall Arena (1 Pepsi size 0.4 = 4 EUR). We arrived shortly after Anne-Line Gjersem (the first skater to take the ice) had skated her SP. Already after the first few minutes of competition, it was obvious how great the atmosphere at these Worlds would be all week long. 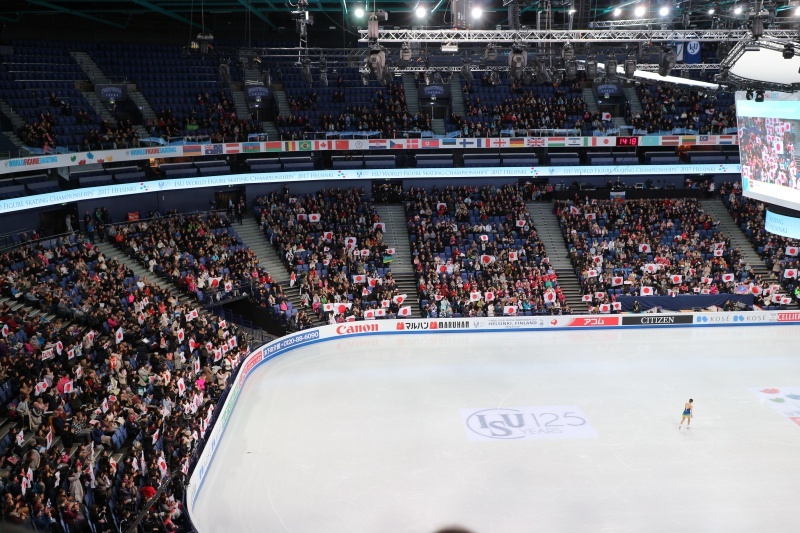 Every skater was supported and the appearance of the Finnish girl Emmi Peltonen brought the house down. 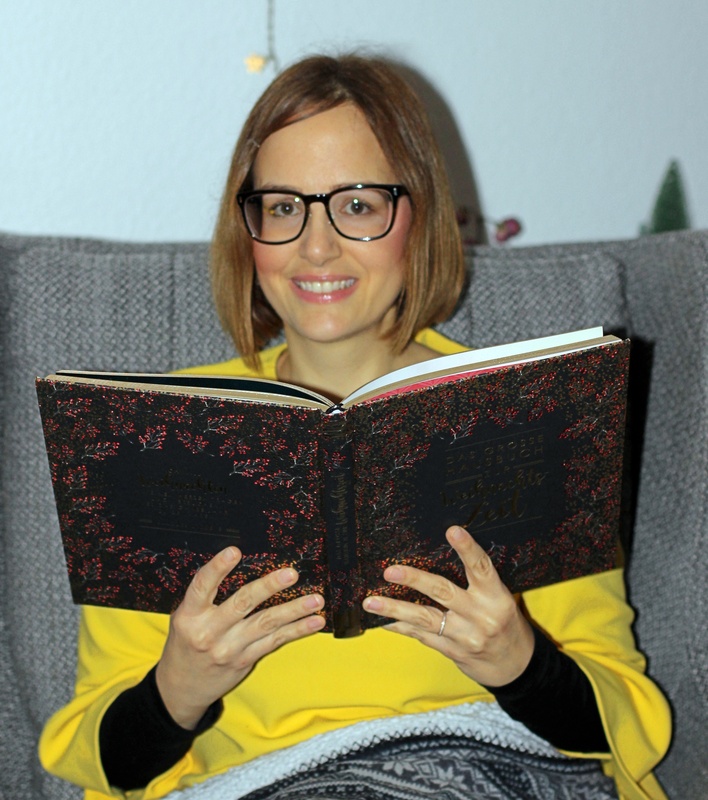 The first highlight was watching the comeback of Carolina Kostner – even though she messed up one jump and one spin (which made me think of an Italian friend who once told me Carolina always messes up her spins when she is nervous). Carolina has grown up so much over the years and it warmed my heart to see how much everyone in the audience seemed to love Carolina. I still remember all the criticism she has received in her earlier years (even from fellow Italians) and nowadays everyone seems to be so in love with her skating and grateful for her still skating. I dare to say she has reached the status of Noriaki Kasai in ski-juming and Ole Einar Bjørndalen in biathlon. When has Rafael Arutunian become THE ladies coach? It felt like he trained 1/4 of the ladies field here. Kind of a mystery to me as he has been for about ten years the coach of Sasha Abt and nobody else. But I bet most of his ladies are way easier to guide and much more disciplined than Abt… When I read the name of Arutunian’s assistant coach Nadia Kanaeva, it ringed a bell. I did an online research and found out I indeed have her on tape from years back when she won a silver medal at Junior Worlds. 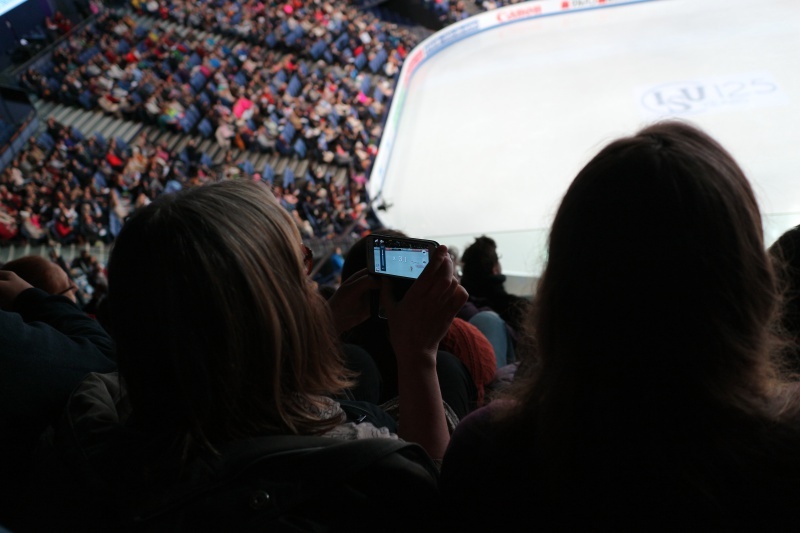 Maybe, I’m not such a casual skating fan – even after all those years. We had already seen Mariah Bell at Nebelhorn Trophy a few years ago and that’s why I could not stop wondering why she dyed her light hair black. This aside, it’s always a pleasure to watch her. It was a magical moment when Wakaba Higuchi took the ice. Suddenly, it felt like being in Japan because a sea of Japanese flags went up in the stands. I will never forget this view. 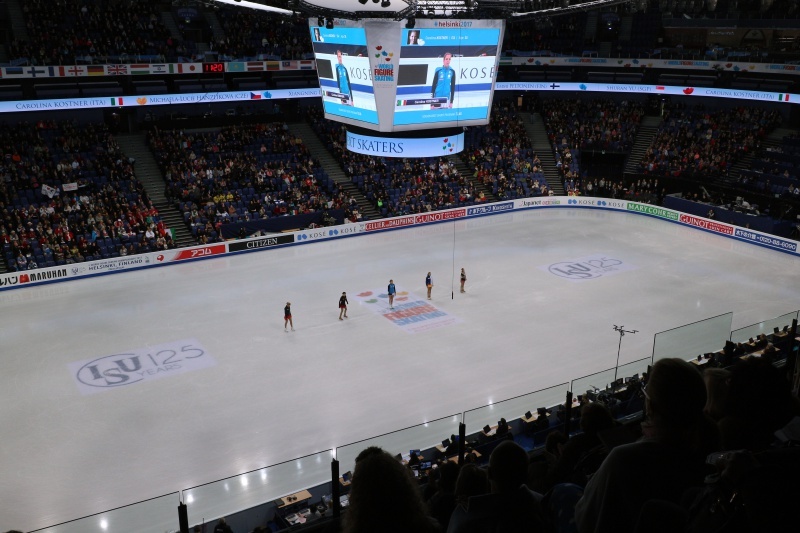 This was also the moment we recognized how many Japanese fans where present here in Helsinki. As they travel with flags from numerous countries, it looked like a mixture of several different nations before Wakaba appeared on the ice. Kaetlyn Osmond nailed every single element of her beautiful Edith Piaff program. Wonderful. I wasn’t too fond of Karen Chen’s elevator music but kudos to her for presenting the first spiral of the event. Elizabet Tursynbaeva’s „I’ve Got Rhythm“ made me go down memory lane and remember Gordeeva & Grinkov’s amazing pro program to the same music. Elizabet is incredibly tiny and cute and it was so funny to see how embarrassed she was by her mom’s exuberant behavior after her performance. Ashley Wagner wasn’t as good as last year but I liked her, anyway, and would like to thank her for making something out of the new freedom when it comes to music choices by selecting „Sweet Dreams“ as her SP music. Maria Sotskova had a rough warm-up but skated a flawless SP. She still looks a bit shy out there on the ice, nevertheless, I enjoy watching her clean style. Anna Pogorilaya has become one of my favourites over the last two or three years. She has never been one of the hyped super talents of Russian ladies skating but managed to establish herself up there in the Russian top three, anyway. Moreover, she is the most womanly, grown-up of all the young Russian girls. In that way, she reminds me a bit of Carolina, already. Here, she ruled the ice with her SP to a Tango from „The Scent“ (we had a bit of a Sale & Pelletier afternoon with this music and also „Love Story“ being used during the ladies SP). I just love her presence on the ice. We established a routine during the break before the pairs SP: we took the train back to the city center and had lunch there. This time, at the Espresso House – something like the „Starbucks“ of the Nordic countries. Both, the former and the current Junior World Champions (Duskova & Bidar and Alexandrovskaya & Windsor) rocked the short program. I hope both teams will stay together (and we will not see Bidar skating for Italy, one day…). And how exotic is this? A pairs team from Australia! Will we see Worlds in Australia, now? (Anyone else who still remembers the soap opera around 2000 Worlds in Nice?). I loved Ryom & Kim from North Korea. They had a very good skate to „A Day in the Life“ by the Beatles (didn’t – soon to be divorced – Michelle Kwan skate to this music?) and it was heart-warming to see how happy they were after their skate. Whatever happened to the curls of Rockne Brubaker (who we saw winning the gold at Junior Worlds in Oberstdorf)? I love the elegance of Zabijako & Enbert. She looks like a ballerina and he has one hell of a good posture. (Oh, how I miss Sergei Grinkov and Anton Sikharulidze…). Marchei & Hotarek rocked the ice to „Seven Nations Army“. Watching her skate is like meeting an old friend on the ice. Ilyushechkina & Moscovitch presented a very lovely waltz. It was pure joy to watch them perform. She seems to be so happy in Canada. The level of this pairs SP was so high, even Kiefer & Ziegler (who we know by heart from Nebelhorn) had the skate of their life – but couldn’t make it to the LP. Too bad about the wobbly throw of Seguin & Bilodeau. I love them (another Nebelhorn find) and no one can do „cute“ quite like them. James & Cipres had a weird fall on the throw 3 twist (after already having landed it properly) but made a fantastic comeback afterwards and nailed every other element. Sui & Han are definitely my favourite Chinese pair team EVER. I’m not a big Blues fan (which should hunt me later on this week…) but they totally rocked the SP even with this music. Hands-down the best team, this night. Savchenko & Massot have a great SP which I had already liked at Nebelhorn (especially the „leap of faith“-similar element). Even after this not flawless SP, Aliona looked so much happier than ever while still skating with Robin Szolkowy and under Steuer. Reading about how she and Robin never ever really celebrated any of their gold medals (together) made me think this is one of the saddest sports stories ever. I think the figure skating community should be stricter regarding „coach and athletes“ relationships because there never seems to be anything positive coming out of it (the last happy couple was probably Tamara Moskvina & Igor Moskvin which was like a century ago). Stolbova & Klimov had a nightmarish skate with several mistakes (including another strange fall on the 3 twist). But it was great to see them support each other and not being mad at each other after their skate. This is how a pairs team should work. In good times and in bad times. I have a huge soft spot for Tarasova & Morozov. The names (like Tatjana Tarasova skating with Nikolai Morozov). Their clean, old-fashioned style. The fact that they look like Tiril Eckhoff skating with Johannes Thignes Bø. I loved their SP and in my opinion they had the most effortless throw of all pairs teams. What a fabulous first day at these Worlds!